This is the vision that greets the author and narrator upon entry the first circle of Hell—Limbo, home to honorable pagans—in Dante Alighieri’s Inferno, the first part of his 14th-century epic poem, Divine Comedy. Before Dante and his guide, the classical poet Virgil, encounter Purgatorio and Paradiso, they must first journey through a multilayered hellscape of sinners—from the lustful and gluttonous of the early circles to the heretics and traitors that dwell below. This first leg of their journey culminates, at Earth’s very core, with Satan, encased in ice up to his waist, eternally gnawing on Judas, Brutus, and Cassius (traitors to God) in his three mouths. 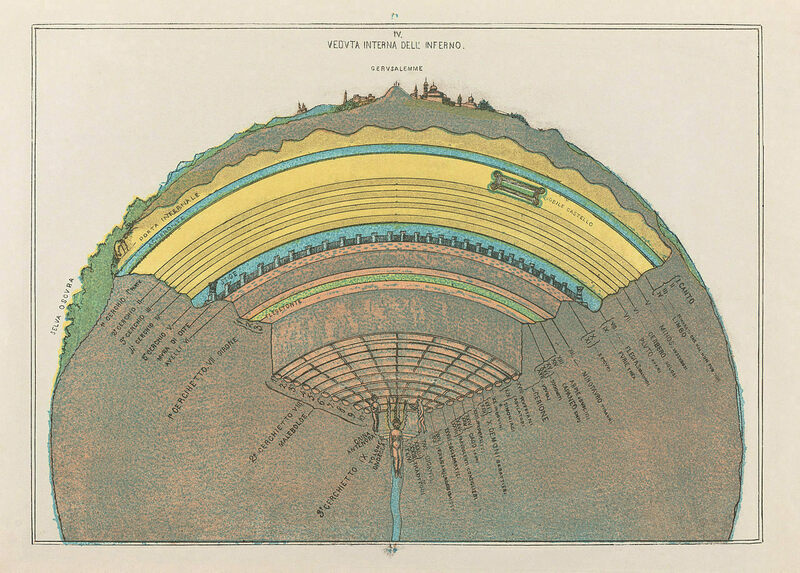 In addition to being among the greatest Italian literary works, Divine Comedy also heralded a craze for “infernal cartography,” or mapping the Hell that Dante had created. This desire to chart the landscape of Hell began with Antonio Manetti, a 15th-century Florentine (like Dante himself) architect and mathematician. He diligently worked on the “site, form and measurements” of Hell, assessing, for example, the width of Limbo—87.5 miles across, he calculated. There are several theories for why it was so important then to delineate Dante’s Hell, including the general popularity of cartography at the time and the Renaissance obsession with proportions and measurements. However, given the inherent limitations of mapping a fictional world, there was some debate between scholars over the specifics. What was Hell’s circumference? How deep did it go? Where was its entrance? Even Galileo Galilei weighed in. In 1588, he gave two lectures in which he investigated the dimensions of Hell and ultimately affirmed the calculations in Manetti’s map. Galileo wasn’t the only Renaissance heavyweight to attempt infernal cartography. Late in the 15th century, Sandro Botticelli—perhaps best known for The Birth of Venus and La Primavera—was commissioned to create a series of illustrations of Dante’s masterwork. His Map of Hell is a lavishly detailed hellscape that depicts the circles as a stepped funnel filled with specific scenes from the poem. After the Renaissance, the desire to deduce the dimensions of Hell waned, before a brief resurgence in the 19th century. Here, Atlas Obscura offers a closer look at the labors of Hell’s cartographers. You'll find that churches offer little sanctuary.